First, if you've Googled your way here via cat bite research, go to the hospital right meow. For real. Second, if you're a regular reader and have been wondering where I've been for the past two weeks, settle in for another long, so-weird-I-can't-believe-it-happened-to-me injury story. As I mentioned in my last post, we brought home our new dog that Wednesday (the 4th). If you follow me on IG, you saw that her meeting with Carl was not very smooth, but Carl settled onto our countertop out of her reach and seemed content enough. We figured they'd both get over it. Fast forward to 6 P.M.: Carl had just finished eating in our pantry, and I opened the door, thinking that he'd saunter out and up and on to our counter before the dog noticed. Wrong. Before I knew what was happening, there was a tangle of fur and fangs at my feet. Without thinking, I pulled them apart and threw Carl into the pantry and the puppy into the bathroom. My hand and legs were bleeding, and Carl was bleeding from his paw. The puppy was fine but was angry to be locked in the bathroom, and let me know by peeing on the floor. My worst wound seemed to be on my right ring finger, where I had to puncture wounds on either side of my knuckle. I washed it twice with soapy water and figured I'd be fine. 3 A.M.: I woke up with a very swollen finger, popped some Advil, put an ice pack on it, and started counting down the minutes until Urgent Care opened. 8 A.M: Urgent care. The doctor looked at it, told me a round of oral antibiotics would clear it up, and laughed at me when I asked him about the study that said 1 in 3 cat bite victims ends up in the hospital. Also, I got a tetanus shot. 3 P.M.: My finger was increasing in size and pain. 8:30 P.M.: Same as above, in addition to a call to my nurse mother who told me to go to the hospital. I told her I'd go in the morning. 8:45 P.M.: John tells me he just got off the phone with my doctor uncle, who told him to take me in no matter what. John had already called his sister to pick up the puppy. 9:45 P.M: Urgent care boots us to the ER, where we don't even have to sit down in the waiting room. Within a half hour, a hand surgeon determines SURGERY is needed to flush the infection. 11:30 P.M.: Pre-op room, waiting for a blood test to confirm that I'm not pregnant (so they can give me the good stuff). I get the all clear, kiss John twice, and that's the last thing I remember of pre-op. 1 A.M-ish: Post-op with my mom and John there. I can't stop shaking from the pain (there are a bunch of nerves in your hand or something) but they've given me the max on meds, so much so that I'm not breathing consistenly, prompting everyone to say "Hannah, you need to take a breath right now!" to get the machines to stop beeping. The next 36 hours were filled with IV meds, assisted bathroom breaks, lots of naps, and several doctor visits. 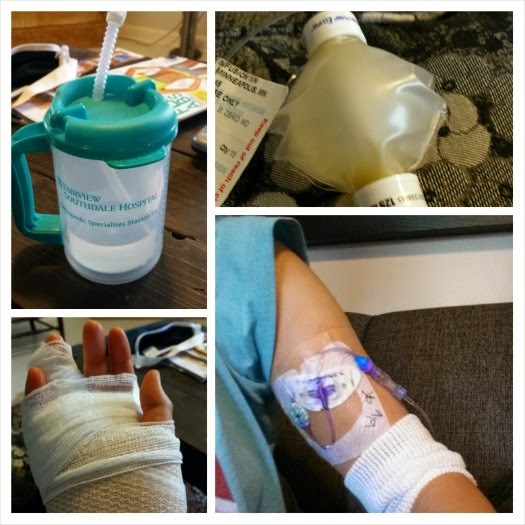 I was finally discharged on Saturday afternoon, after getting a PICC line implanted in my upper left arm so I could continue IV meds at home, every 8 hours, for the next two weeks. I'm now nearly two weeks post-op, and I get the stitches out tomorrow. I should be done with the IV meds on Saturday, so the PICC line will come out then. I also have to go to hand therapy twice a week for the foreseeable future because they cut through the tendon sheath in my finger. In puppy news, she's been re-homed to John's sister, who fell in love with her while babysitting and refused to give her back. Carl is still living at home and meowing apologies. In husband news, I have the best one ever. He's been so, so great with everything, and can even put my hair into a semi-decent ponytail. I'm one lucky lady! 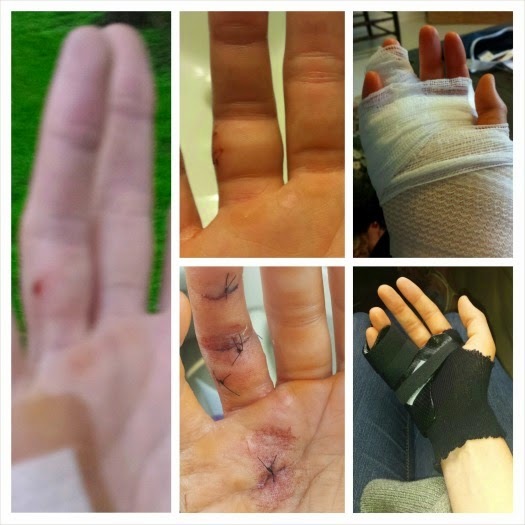 And finally, here's an evolution of my injury from an hour after it happened to what it looks like splinted.